Whether creating a new build or renovating an existing one, it can be an expensive business and, as all home owners know, every detail counts. Your budget will be dependent on how much you can afford to spend and how many rooms you would like to make improvements to. If your budget is rather tight then this planning stage is all the more important. If you have a bit more cash to flash then you'll have far greater freedom to incorporate some of the more grandiose and exclusive designs. If you are looking to renovate your entire house on a tight budget, then the choice of door handle becomes all the more important. 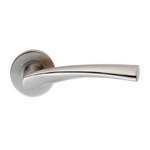 Handles4Doors have a selection of stylish, yet affordable handles that would be perfect for either a traditional style home or a modern pad. If your home is decorated in a traditional fashion and you would like a classic style handle for a good price then the victorian door handles on backplate would be ideal. If your home is a more rustic fare then The Tudor Collection handles would be perfect; the matt black powder coated finish means that it would add an old country look to any property. For a modern property there are many contemporary designs available. A door handle on rose instantly looks modern and fresh, the Eurospec CSL handles on rose are stylish, modern and a reasonable price. With style and a price this good you could update the downstairs of your property with ease. 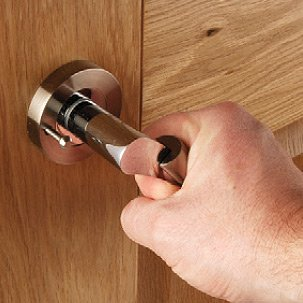 Blow the budget, if price is not a problem then why not go to town with an original and fun door handle. The Karcher Orlando Door Handle on Rose is a funky modern design with Swarovski crystal detailing on the front of the lever. Karcher handles are all made from quality stainless steel and are highly durable, meaning that they will last for years to come! For that real luxury feel, the DND Hardware collection of door handles on rose is ideal! These high quality designer levers are unique and really do stand out once fitted. If you like your decoration to be homely and traditional but with a bit also make something of a statement you might want to consider something like the Curly Tail Door Handle on Gothic Backplate. This would make a great bathroom door handle and will be a great focal point whilst being highly practical too. But of course, these suggestions aside, there are so many options available for furnishing a house, covering all budgets and requirements. 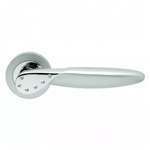 You can pick up door handles that are fantastically elegant just as easily as those that are simplistic and subtle. Modern materials and techniques have allowed for greater versatility in design, allowing consumers to be extremely picky about the handle they ultimately purchase. The upshot of all this for you is that there is a far greater range of products from which to pick and increased competitiveness in terms of pricing, making it a better deal all round.